Because the recession, Daddy was forced to sell off some of his oil shares and scale back on his diamond mining operations, and I was forced to choose between my butler Reginald or my prize-winning koi ponds. I was distraught, of course, as dear Reggie has been with the family for ages, but he was quick to point out that I can now get the same soothing koi pond experience right on my iPhone. Smart man, that Reggie. How I’ll miss him. 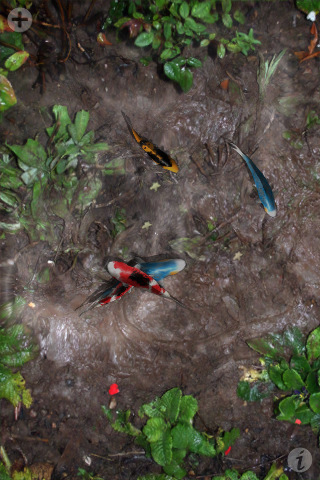 John Moffet’s Pocket Pond is a nice little pool of tranquility in an otherwise chaotic iPhone world. You get a small koi pond populated with fish. Touch the pond and ripples will disturb the surface and chase the fish away, but they always come back, the silly things. You can also decorate the pond as you see fit with water lilies, which is a nice touch, but I only ever let my prize-winning landscape architect and live-in gardener attend to such matters. There is also a mini-game of sorts that allows you to release dragonflies to skit and play above the water. They’re very quick, but if you manage to smash them, they drop to the surface as fish food. I abhor insects, personally, but like Daddy always tells me, there is something inherently satisfying about grinding the weak and poor underfoot. There’s also a setting to torment the koi with a thunderstorm if you like, but it’s actually tucked in a different place than the rest of the settings, presumably so the developer could flash a big ad for the premium version at you. I found it impossibly tacky, but I couldn’t help admiring his capitalistic spirit. It is a rather basic app, all things considered, but Daddy always tells me that it’s better to buy a Matisse when you find it for cheap, than later when it’s overpriced by those pompous fools at Christie’s. Of course, I could never tell the difference between a Matisse or a Mogdiliani, but I still like playing with my little digital fishies. The graphics and sound are lovely and soothing, and the controls are beautifully responsive. It’s quite delightful to see the fish scatter in terror from my fingertips. At this price (free), I imagine even our servants could afford this, although I suppose I’ll have to find someone to feed my other fish now that Reginald is gone. AppSafari review of Pocket Pond was written by Tracy Yonemoto on May 13th, 2010 and categorized under App Store, Free, Games, Mini Games. Page viewed 4176 times, 1 so far today. Need help on using these apps? Please read the Help Page.